Washington County VA topped the high-end home market in 2016, but it was a crowded field. A high-end home in the Market Edge’s Residential Building Permit Trend Report is one with over 4,000 sq. ft or a permit value of over $400,000. Washington County TN has dominated the high-enders for the past three years and 2016 was a return to new permits in double digits for Sullivan County. Here’s how that field looked at the end of the year. The regional count of 77 is up seven from 2016. 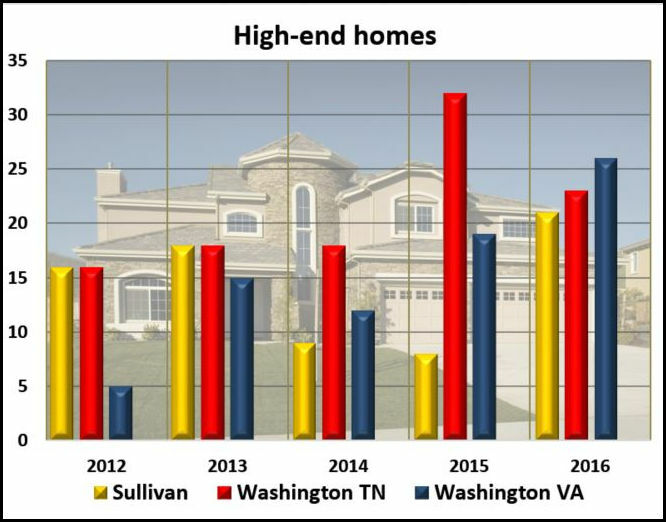 Last year was also the second year that the year-over-year growth of high-end home permits has outpaced the growth rate in the other two East Tennessee MSA monitored by the Market Edge Report. The 2016 year-over-year change in Chattanooga was 0% and 3.5% in Knoxville.